Unzip is a term used to describe the process of extracting the files from a zip archive. Zip archives are commonly found on Windows® Operating System. Larger files are compressed into a file (.zip) for easier download. If you downloaded a zip file from the Linksys Support Site, you need to unzip it first before you can install the software. 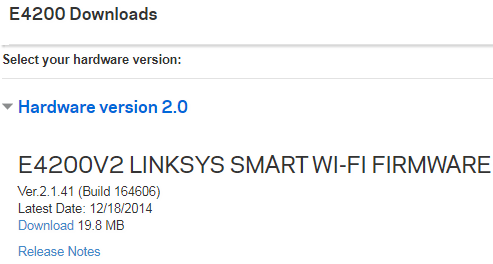 NOTE: In this example, we will be downloading the Linksys Smart Wi-Fi Router, E4200 v2 firmware. Download the firmware (zip file) of your Linksys device. QUICK TIP: You will be prompted with the End User License Agreement, click the AGREE button. Locate the file you downloaded. 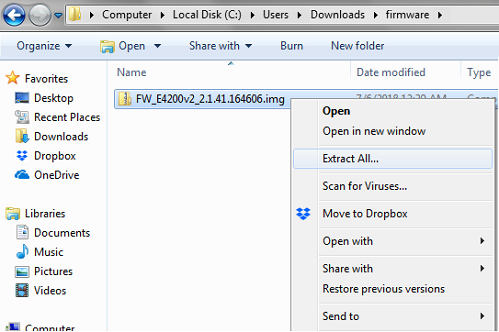 Right-click the downloaded file and click the Extract files… option. NOTE: The extracted firmware will show on a folder. Locate the file you downloaded. Right-click the downloaded file and click the Extract All… option. Locate the file you downloaded. Right-click the downloaded file and click the Extract All... option. Locate the file you downloaded. 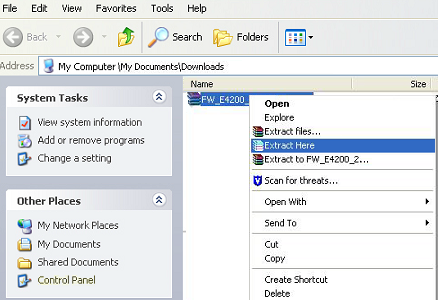 Right-click the downloaded file and click the Extract Here option.